Dig In will be running several art & craft workshops led by Nottingham artist Joyce Killowe. The sessions will take place at the community allotment on Saturdays and run from 10am until 1pm. The dates and topics are as follows, but due to anticipated demand, pre-booking is required. 5th April - Make a Collage full of Spring’s textures and colours. 26th April - Willow & Fabric Weaving – creating flowers or insects. 24th May - Mosaics – decorate a container or make a mirror frame. 5th July - Lantern Making with recycled tin cans. 26th July - Floral & Herb Scented Arrangement - seasonal. Join artist Joyce Killowe to learn new crafts in a relaxed, friendly environment. Venue: Dig In Community Allotment, Stapleford, Notts. The site has toilet facilities. Cost per workshop: £5 waged, £3 children and unwaged (includes light refreshments). • All materials and equipment are provided. Please note that due to the materials and process used in the mosaics workshop, there is a minimum age restriction (8 years) for children and parental guidance is required. This year, Dig In will be running several gardening workshops led by qualified and experienced horticulturalist, Karen Fry. The sessions will take place at the community allotment on Saturdays and run from 10am until 12 noon. 22 March Soils – not just ‘dirt’! 12 April Recycled Container Gardens – turn almost anything into a plant container. 10 May Compost – what to put in, how to look after it. 7 June Good Companions – companion planting and space-saving. 28 June Green Manures – growing plants to feed your garden. 2 Aug Wildlife in the Garden – our ‘Friends and Foes’. 16 Aug Growing through the Winter – beat the weather. Brush up on your skills and learn through practical activities in a relaxed, friendly environment. • The site has toilet facilities. Cost per workshop: £5 waged, £3 unwaged (includes light refreshments). • Dig In volunteers free of charge. We are pleased to announce that Dig In Community Allotment in Stapleford has funding to run free sessions for schools local to the Stapleford area during Spring and Summer term 2014. The sessions are coordinated by an experienced environmental educator and can be tailored to all age groups. The site includes a fenced pond with dipping platform, wildlife gardens, productive gardens, orchard, polytunnel and accessible compost toilet. Dig In volunteer, Roy (on the right in the photo) handed over a cheque for £1000, which had been raised and donated by his nephew, Alex Oldershaw. 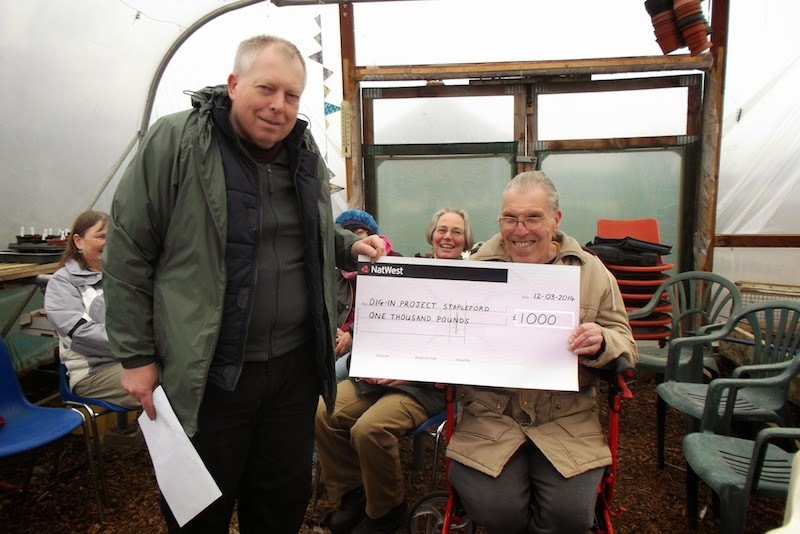 The presentation event took place in the Dig In polytunnel on March 12th, accompanied by some of Helen's homemade pumpkin soup and Mary's homemade fruit cake. Alex raised the money through sponsorship of his participation in the Chicago Marathon in 2013. We are bowled over by his generosity! The purchase of a park bench for the Dig In site will be first on the list, with the remainder being put to good use for repairs, equipment and materials for Dig In. On behalf of the Dig In management committee and volunteers, thank you again Alex, for your wonderful donation and support. Dig In is situated on the Albany Allotment site, Pasture Road, Stapleford, Nottingham. Copyright Dig In Community Allotment, Stapleford. Watermark theme. Powered by Blogger.